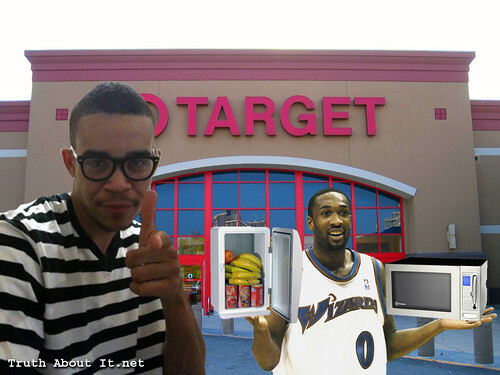 Even though we’re in a state of “this damn economy”, we can rest comfortably that there’s always an NBA player willing to implement his own mini-stimulus package to consumerism … such as Gilbert Arenas and his need to purchase a refrigerator and microwave for one day. And this took place in Michigan, which has recently fallen on hard times … so more kudos to Gil. How do we know about all this? Why, the Twitter account of one @bigdaddywookie aka JaVale McGee. Now, some were calling it ‘rookie hazing’ … but JaVale will be the first to tell you, he ain’t no rook. But since Arenas was out pretty much all year, is JaVale a rookie to him? We’ll probably never know since Gil isn’t talking to the media. Still, that doesn’t answer the question at hand … did JaVale end up carrying Gil’s ‘Top Chef For A Day’ accouterments? A follow up Twitter-query as to if Gil and JaVale both pushed the cart side-by-side went unanswered. Still, McGee should feel lucky. In the past, the prank-playing Arenas might have rubbed Icy-Hot on the inside of McGee’s transformer helmet or de-clawed his Wolverine toy for such an instance of non-compliance. Whatever the case may be, shopping with Gil is probably better than being lonely in Grand Rapids.